College Park, Md.—Registration is now open for the University of Maryland Project Management Center for Excellence's First Annual Project Management Symposium. 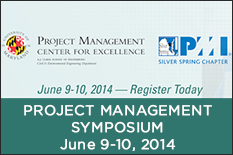 The symposium will be held June 9-10, 2014 in the Stamp Student Union on the University of Maryland’s College Park campus. This event is being held in partnership with the Silver Spring Chapter of the Project Management Institute (PMI) and with media sponsorship support from the Project Management World Journal. Featured speaker Ron Taylor, Principal and Founder of the Ron Taylor Group and author of The 77 Deadly Sins of Project Management will present “You’re Not the Boss of Me.” All of us have a boss. Your boss might be a person, a system or a belief, and your boss can have a profound effect on the way you lead programs, projects and people. Taylor will share stories and lessons from his considerable experience and research—on sources ranging from Aristotle to Zig Ziglar—that will help you take ownership of your job, your career, and your life. Connecting academically rigorous research with practical applications, this symposium will feature over 35 guest speakers and bring together project management professionals from across academe, industry, and government to share, explore, and learn the best management practices for today’s dynamic project environments. Register by April 1, 2014, to receive the early-bird registration rate. For more information, or to register, visit the University of Maryland Project Management Center for Excellence’s website.